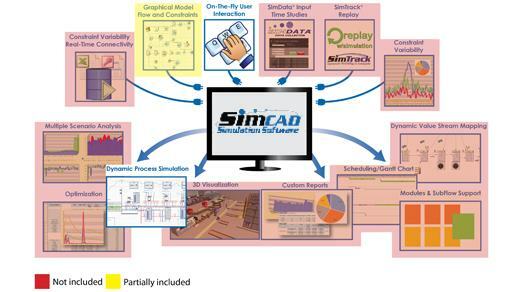 Simcad Pro : next generation dynamic simulator operates under an entirely different paradigm than traditional static tools. The graphical interface used to build models does not generate or compile code since it interfaces directly with the multi-core simulation engine. When the simulation starts, the animation instantly displays, both in 2D , the current state of the engine. As inefficiencies develop, real time modifications can be made to model properties and constraints. These “on-the-fly” changes allow users to instantly realize potential gains and perform dynamic optimization. As a result of the no-codemodeling, Simcad Pro’s dynamic capability drastically reduces the time required to build, analyze, and optimize simulation models. Simulation modeling is no longer the forte of the elite few, but a tool used by a vast spectrum of users enabling industries to benefit from the power of dynamic simulation. This product has a 50 station limit, 10 0bject types, and a single level containment definition.